Corey Chase, a state telecommunications infrastructure specialist, went on a road trip to ground-truth cell carriers' claims about coverage. Last fall, Corey Chase drove 6,000 miles around his state to ground-truth what every Vermonter with a cell phone knows: there are many, many places in the state where you simply can't get a signal, not to mention the 5 megabits per second data download speeds the carriers were claiming. The six-week effort involved six cell phones, a state-owned Prius and an app from a software developer in Bulgaria. 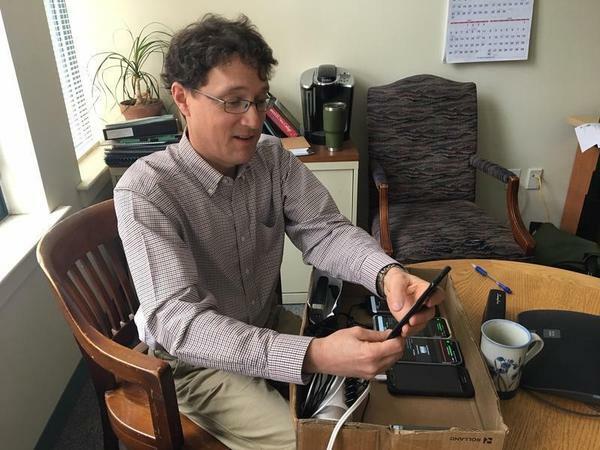 What Chase, a Vermont Department of Public Service employee, found is now part of a detailed challenge before the Federal Communications Commission that officials hope will bring federal dollars into the state to improve the wireless network. Chase, a telecommunications infrastructure specialist, drove the equivalent of Montpelier to Los Angeles and back. But his windshield time was along state roads and through town and village centers, at a slow pace of 40 mph. And occasionally he found himself on no road at all. "There's apparently a road that goes from Stamford to Bennington. I tried to take said road," Chase said. "And there's a state-government printed sign on the road that says: 'Your GPS is wrong, turn around now.'" Although Chase saw lots of beautiful sights and foliage driving around the state, his excursion was really a massive data collection project. 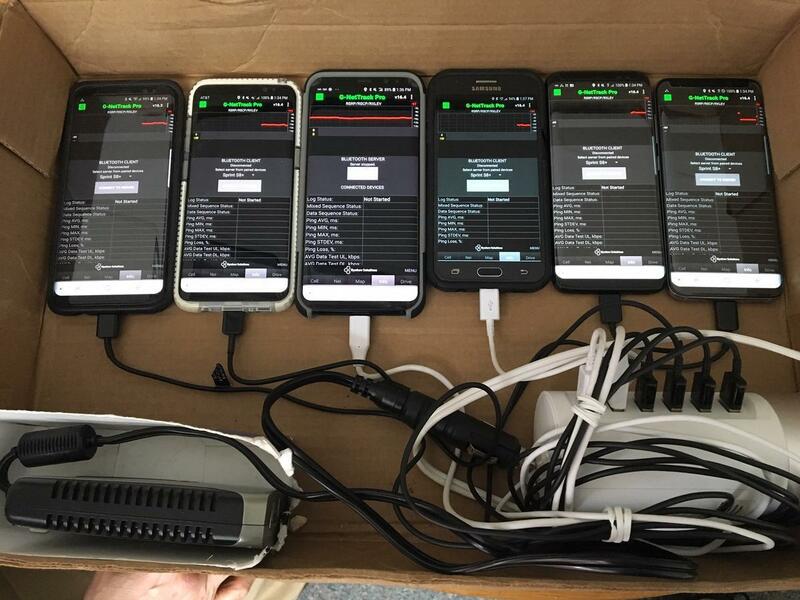 The six phones, each served by a different carrier, used in the state's road test this fall. "I think it's fair to say that our data showed wide disparities between what certain carriers reported and what was our experience on the ground," said Clay Purvis, the state's telecommunications director. Cell phone providers' maps for Vermont showed that basically the entire state is well covered, said Purvis, with the exception of pockets of Essex County in the Northeast Kingdom and a chunk of the Green Mountain National Forest near Hancock and Rochester. The FCC uses those maps to determine what areas of the country qualify for grants to boost service to underserved areas. And by the cell companies' claims, most of Vermont gets a decent signal from at least one of the six providers. "The FCC has recognized this issue, and they've now opened an investigation into those maps that were submitted," said Purvis. The state challenged the carriers' maps following a rigorous procedure for data collection outlined by the FCC. That's what had Chase driving around with the six cell phones, each capable of sophisticated download speed tests every 20 seconds. The result was 187,506 download speed test results at locations about 360 meters apart along all of the major roads in the state. At stake in the state's project is potentially millions of dollars in federal money. The FCC has $4.53 billion available to use around the country. "What we were looking at was being almost completely foreclosed from any of it because our state was considered nearly completely covered with 4G LTE service," Purvis said. "And now we've opened up a significant amount of that space." Purvis and Chase hope their work will convince the FCC to open more territory in Vermont for the access funds. If so, the FCC will conduct a reverse auction process to find carriers to commit to providing mobile service in these underserved areas. DILLON: Chase tests the coverage in my mailbox. Three of the six companies showed no service, the rest had very weak signals below what they claimed - but I could have told you that. For NPR News, I'm John Dillon in Montpelier, Vt. Transcript provided by NPR, Copyright NPR.